The houses are based on well-established solar passive design principles to ensure maximum thermal comfort year round, with no air-conditioning or artificial heating requirement. Energy and water efficient fixtures and appliances, combined with onsite power generation, rainwater harvesting and greywater recycling all contribute to the environmental performance of the homes. East-west orientation with maximum glazing to the north for winter solar gain (shaded in summer) and minimal glazing to the east and west to minimise summer heat entry. High thermal mass materials used on the inside of the buildings to absorb winter solar gain and stabilise internal temperature during summer. High insulation value to roof and walls to minimise uncontrolled heat loss/gain, and pelmeted curtains on the windows to reduce heat loss in winter. A combination of reverse brick veneer and double brick walling has been used in order to increase internal thermal mass where it was needed. Where this wasn’t required, timber framed walling is used because the materials have a lower embodied energy value and therefore a lower carbon footprint. Low-e glazing was chosen throughout to regulate heat flow. Surprisingly, only one double glazed window was required in each house to achieve a 10 Star rating and this was in the kitchen where the use of curtains to keep in winter warmth wasn’t practical. Lighting is provided by a combination of LED down lights in the bedrooms and living areas (kitchen, dining living room and activity room), and compact fluorescent globes in occasional use areas (bathroom, laundry, toilet and hall way). Solar tubes help to ‘daylight’ internal areas such as walk-in robes to reduce the need for artificial lighting. Reversible ceiling fans have also been installed in the bedrooms and living areas to provide downward cooling and upward circulation of warm air in winter. Both houses originally had a 3kW grid connected photovoltaic system installed, as well as gas boosted solar hot water systems. Josh’s House has since undergone a series of solar system and fixed appliance upgrades to test new equipment for research purposes, including additional PV, battery and heat pump hot water system. High efficiency shower heads and tap ware has been selected, and the low volume dual flush toilets have integrated hand basins which use tap water to fill the cistern. The landscaping also helps address a number of pressing urban sustainability issues including improved household energy efficiency through appropriate shading, habitat provision with local native plantings, as well as local food production with an extensive shared vegetable garden, home orchard, poultry, composting and worm farm system. The hard landscaping works incorporate locally sourced and salvaged materials, including items from the demolition of the original cottage. Permeable, rather than sealed surface treatments have been used where possible to allow for localised storm water infiltration, and paving has been laid to direct water in to garden beds. 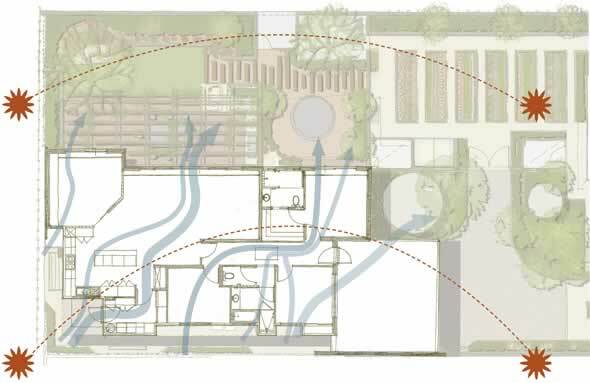 Both houses have direct diversion greywater systems to provide irrigation to selected areas, as well as rainwater tanks for internal usage, with mains water back up for dry periods. The productive garden are watered from a shared bore and a state of the art centrally controlled irrigation system, incorporating both soil moisture monitoring and weather monitoring to maximise water efficiency. For further information on the sustainability features of the homes you can find fact sheets on the Josh’s House Resource Page.